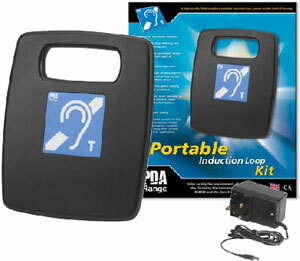 View details on the PL1/K1 Portable Induction Loop Kit below or download the specification sheet. Over 10% of the population suffer from hearing impairment. Under the Disability Discrimination Act, anyone offering goods, facilities or services to the general public must make 'reasonable' adjustments to ensure they do not discriminate against such people. One of the easiest ways to meet this requirement is to have a portable induction loop systemavailable and ready for use at all times. Attractively designed in tough ABS plastic, SigNET's PL1/K1 portable induction loop system is a truly portable and extremely durable audio frequency induction loop system, packed full of features and availableat a very competitive price. Fully compliant with BS7594 and EN60118-4, it is ideal for use in schools, shops, nursing homes, leisure centres, hotels, banks, GP surgeries, reception desks and many other private, public and civic applications. (supplied in a cardboard storage/carry case) Includes PL1 amplifier c/w battery & integral microphone, PL1/PSU1 plugtop charger and TEAR-P ‘AFILS available’ sticker. (supplied in a robust plastic storage/carry case) Includes PL1 amplifier c/w battery & integral microphone, PL1/PSU1 plugtop charger and TEAR-P ‘AFILS available’ sticker. Remote input socket for optional tie/desk mic. 250 x 300 x 100mm approx.